Shane Bowers, a highly-regarded prospect with speed, skills and size, has committed to BU for 2017. 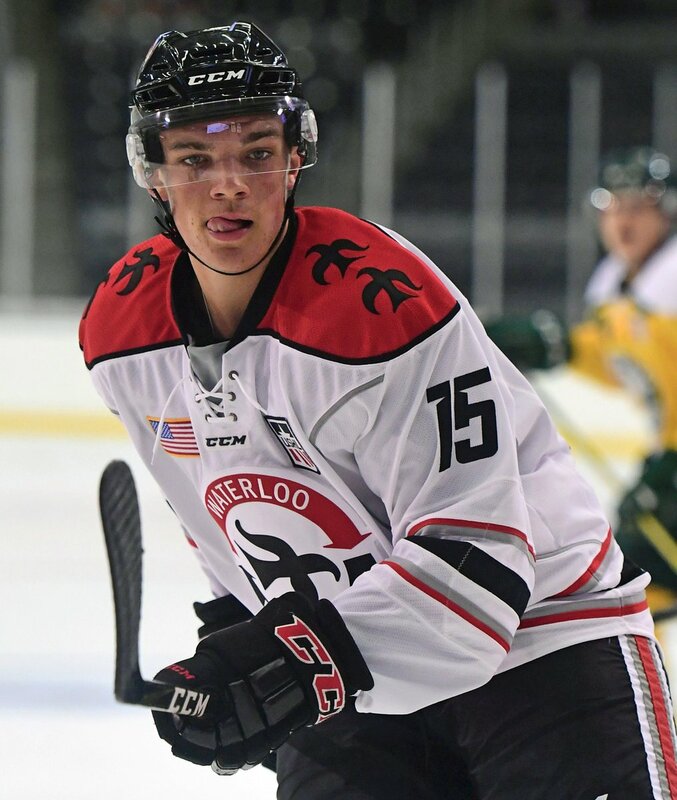 The 6’1”, 178 lb., left-shot center from Halifax, Nova Scotia, who has been projected as a mid-to-late first round pick in next June’s NHL Entry Draft, is in his second season with the USHL’s Waterloo Black Hawks. Finalists for the 17 year old Bowers --one of only three USHL skaters to receive an “A” rating from Central Scouting— were BU, BC and Wisconsin. Excited to play college hockey at Boston University. Looking forward to being a part of the BU tradition! Can't wait to be a Terrier! Shane Bowers, C, Waterloo (USHL)- 200 foot guy that works well with the puck. Great speed and natural skill. Plays with a lot of gumption and makes life hard for opponents. A serious offensive threat thanks to his skating, skills and smarts, Bowers is a point-per-game player in the United States League so far. That's a marked leap from his rookie production, which was pretty solid itself, but the kid is hot with six points in his past four games. ►HockeyProspect.com rated Bowers #18 for the 2017 draft, while ISS has him at #22 and TSN's Craig Button ranked him #12. In his first USHL season as the youngest player on Waterloo, he had a 15-18-33 line in 56 games earning All-Rookie second team honors. Currently, Bowers has five goals and four assists in nine games for the Black Hawks. This past summer, he was one of a handful of non-Major Junior skaters named to Team Canada for the prestigious Ivan Hlinka Memorial Tournament where he scored once in four games. Before heading to the States, Bowers was a standout scorer for his hometown Halifax MacDonald’s in the NS Major Midget league, scoring 52 points (23G, 29A) in 34 games to lead the league in goals and points and earn the MVP award. He would add another 33 points (15G, 18A) in 17 playoff games. The previous season, Bowers led the Bubba Ray’s Gulls to the Bantam AAA Irving Oil Challenge Cup title and was named the tournament MVP. Peter MacArthur, another talented center who played for the Waterloo Black Hawks before becoming a 147-point scorer in four seasons at BU, is beginning his second season with the ECHL Adirondack Thunder as team captain. MacArthur had spent four seasons in Europe before returning Stateside last year. The Clifton Park, N.Y. native was a member of BU’s 2006 Hockey East champions and earned second team All-American honors as a senior. Kevin Shattenkirk's third goal of the season gave St. Louis an early-second period lead against Detroit, but the Redwings tied the scored and won, 2-1, in the eighth round of a shootout. Colin Wilson's unassisted goal kept Nashville from being shut out as Anaheim dominated the Predators, 6-1. AJ Greer scored a goal and added an assist as AHL San Antonio doubled up Cleveland, 4-2.